Epstein-Barr virus (EBV, also termed human herpesvirus-4) was the first identified human tumor virus. 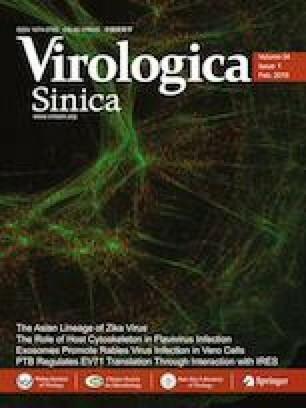 Since its discovery in 1964, studies have shown that EBV infects over 90% of all people by the time they are adults (Williams and Crawford 2006). EBV infection can result in mucocutaneous and systemic diseases, ranging from self-limited illnesses to aggressive malignancies, including B cell Hodgkin lymphoma and nasopharyngeal carcinoma. In vitro, EBV transforms resting B cells into proliferating blast cells (Pope et al. 1968). This transformation depends on the expression of nine viral latent proteins, including latent membrane protein 1 (LMP1). LMP1 expression in B lymphocytes can constitutively result in lymphoma. EBV-positive tumors express LMP1 on their surface (Deacon et al. 1993). These findings have implicated LMP1 as a suitable target for immunotherapy to treat EBV related Hodgkin lymphoma and nasopharyngeal carcinoma. This work was supported by the National Natural Science Foundation of China (Grant Numbers: 81402542 and 81772166) and the scholarship of Pujiang Talents in Shanghai to Fang Wei (Grant Number: 14PJ1405600).